At the heart of Sayaka Ishizuka’s artistic practice lies a tacit sensitivity to the small, commonplace objects in which are embedded the stories and histories of lived cultures. The idea that the universal can be accessed and expressed in art by way of the personal is one that is realised with striking clarity and a humbling lack of self-consciousness in the work of Ishizuka. Taking as their medium objects unremarkable in their ready availability or often-overlooked presence in daily life—rice, threads, used articles of clothing, discarded household items—and paying heed to the social and cultural associations they carry, Ishizuka’s installations subtly transform these items into leitmotifs for interconnectedness in the broader sphere of human existence. 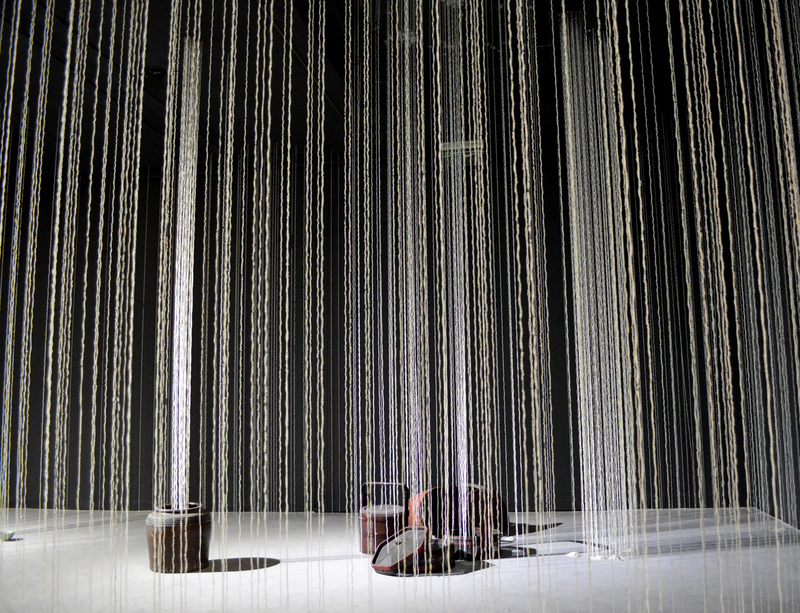 Significant in this process is that each of Ishizuka’s installations is resolutely grounded in the lives “lived” by the objects from which it is composed, and the lives of the people that these objects inhabited. Taking her cues from the dialogue and interaction that occur between these “objects with a past” and the installation space, the artist weaves them into spatial configurations—often suspending items from the ceiling—of the messages relayed to her by the space and the medium. Beginning her creative process on the level of the real, the lived and the experienced, rather than the grandiose and abstract, Ishizuka selects personal histories, memories, daily rituals and processes, all of which are tied to site and place, as the point of departure in fleshing out her simple yet profound spatial diagrams of the ties that bind us. Like many young art practitioners, conventional mediums were her entry point into art-making. Born in 1980 in Shizuoka, Japan, Ishizuka picked up painting as a child, and her early enthusiasm for the visual arts was bolstered by the increasingly widespread access to art that growing up in the 1980s bubble years of Japan’s economy afforded. She recalls outings to museums with her father during a period where Japan saw a dramatic increase in the number of new public art institutions as well as private galleries, the mounting of ambitious modern and contemporary exhibitions of both Japanese and non-Japanese art, and widespread corporate funding of new media art that continued into the early 1990s. Fresh out of high school, Ishizuka made the decision to pursue a university degree in fine art. A teenager well versed in the names and works of celebrated modern painters from the West—Paul Klee, Wassily Kandinsky, Jean Debuffet, Gustav Klimt and Cy Twombly, among others—Ishizuka first entered the art department at Joshibi University as a painting major. During her first year at university, Ishizuka attended the 2000 Echigo-Tsumari Triennial as a volunteer. Citing this as an early pivotal moment in deciding what direction her chosen mode of art-making would take, Ishizuka recalls her experiences in meeting the volunteers, participants, artists and other individuals that came together in collaboration during the event as sparking the realisation that art-making could be a participatory process rather than a solitary one. The Echigo-Tsumari, or “big-field”, Triennial was inaugurated by Japanese developer Fram Kitagawa in 2000, in a bid to re-situate art and its audiences back to remote, rural regions of Japan facing underdevelopment and industrial decline. Featuring sculptural and site-specific installation works in reconverted old, abandoned buildings in the countryside, Echigo-Tsumari presented an alternative to “Cool Japan” and the urban culture together with its development model that dominated in Tokyo and elsewhere in the country. Repurposing crumbling buildings and a forgotten rural landscape for the possibilities of an art festival that was organic and community-based, it sought to reconnect artists and viewers alike with their regional roots. 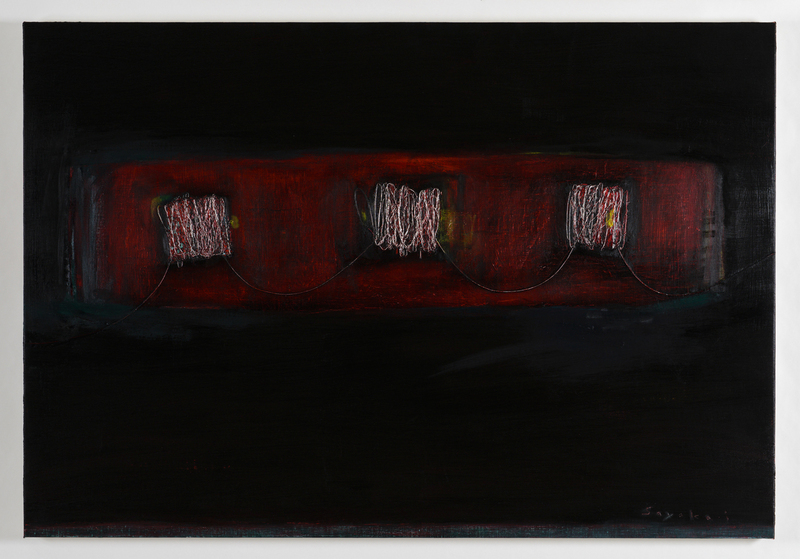 started to experiment with the use of thread, wire, paper, canvas, and the method of collage.” It turns out that thread is a particularly appropriate material with which to “paint in space”, which is how Ishizuka often characterises her method of suspending objects in conversation. 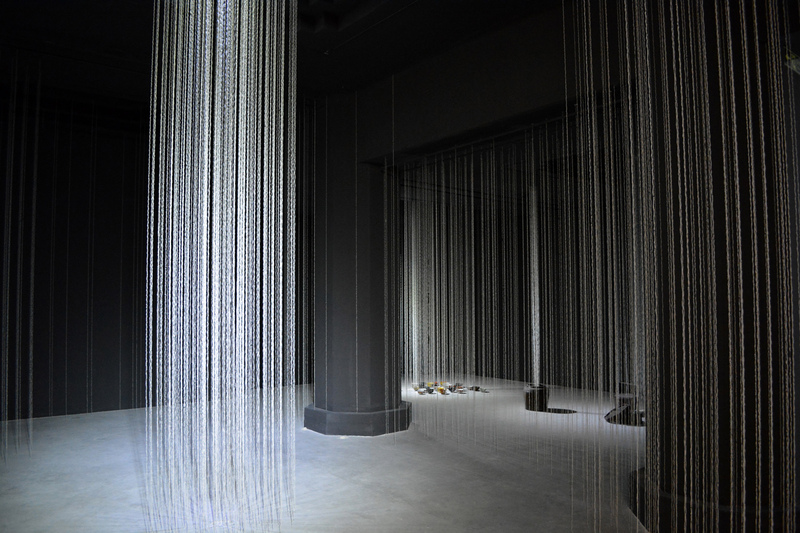 At the same time, phrases such as “threads of destiny” and “threads of memory” in the Japanese language, and the fact that “thread” as a word is often used to describe connections between humankind, give its use an added dimension of history and emotion in Ishizuka’s works. 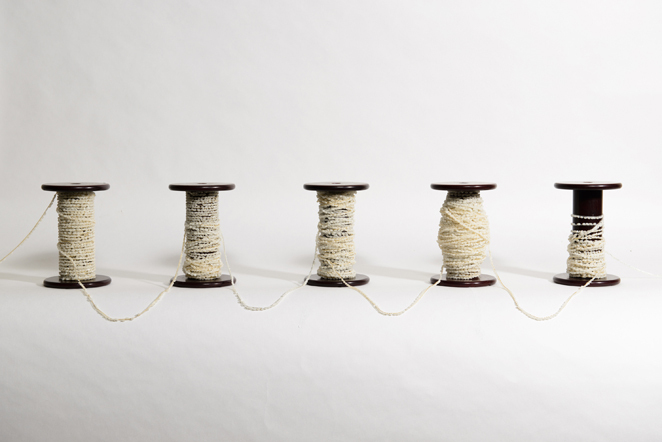 Ishizuka also points out how these threads are each composed of thinner strings kneaded together painstakingly by workers in the production process, and are each telling of intricate handiwork, process, time and labour. The main walk-in installation work Rice Deity (2014), specifically created for this exhibition, is developed from a previous installation of the same name exhibited in the 2009 Echigo-Tsumari Triennial. 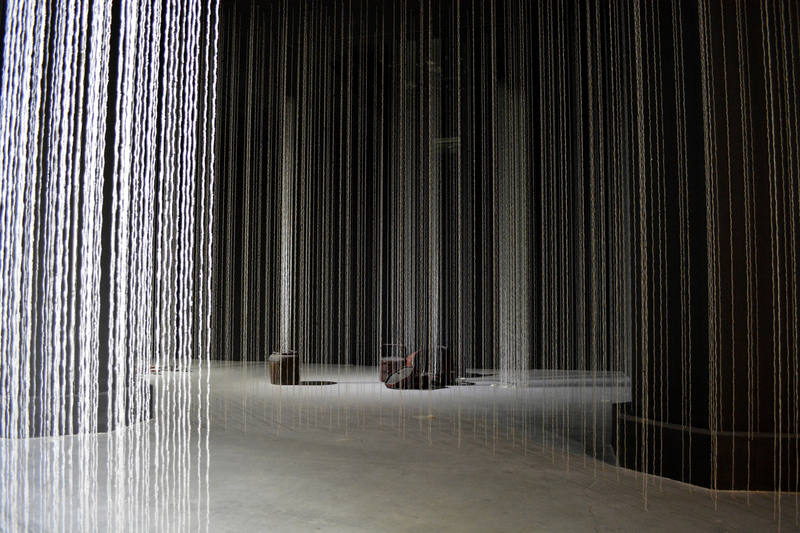 The work was composed of thousands of strings of rice, each three to four metres long, suspended from the entire ceiling of an old Japanese house together with used utensils and farming equipment. Rice Deity (2009) was exhibited in an old building surrounded by rice fields, which is located in the Uonuma area of Niigata Prefecture, Echigo—one of the most noted areas of top quality rice production and therefore holding symbolic importance for Japan. The local residents in this area and its surrounding villages subsist on rice as livelihood: they plant it on artificially terraced fields on the hillsides, harvest it, sell it, as well as consume it. When Ishizuka first exhibited Rice Deity in Echigo in the summer of 2009, an elderly rice farmer who lived nearby stopped by the doorway of the installation space, read the exhibition brochure and immediately expressed his confusion that she was wasting precious rice by using it in “silly” artworks! Adamant as he was that she was using rice in a wasteful way, he was eventually entreated by Ishizuka to enter and view the installation. 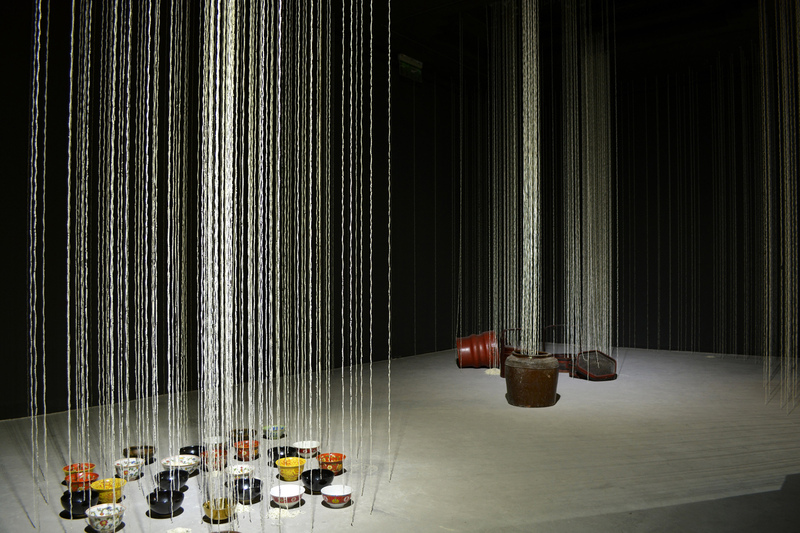 The artist recalls the humbling and revelatory experience that followed: the farmer emerged from the installation space only to tell her that she had given the rice grains life again—that she had made every grain “shine” and that her use of rice was anything but a waste. The entire Echigo-Tsumari project lasted a year and a half for Ishizuka. The first half of the year was spent in planning and “rice deity” is a term that Ishizuka came across coincidentally in her readings during her research on rice and its farming methods. She thought it a fitting title: while exploring the area surrounding the exhibition site she had found a little jinja—a Shinto shrine—near Uonuma, where one of the small gods worshipped there was a deity of the rice harvest. Shinto (“the ways of the gods” or 神道) has been the state religion of Japan for over 1,200 years and stemmed from an awe and respect for nature in ancient times. It developed into the worship of multiple gods of natural phenomena, as well as of Japan’s ancestors. Hundreds of thousands of shrines are still today dedicated to a whole multitude of “gods” or “deities” all over Japan, in big cities as well as small villages or towns, and the most widely observable are the ones built in worship of rice deities. These Shinto traditions have evolved into a broader collective culture, not one exclusively pertinent to religious belief. For instance, a common collective memory of Japanese children is one in which their parents told them that there were little deities living in each grain of rice in their bowls, and so they should eat them all and not waste them. People say itadakimas before they eat and put their hands together, which means “we are taking the soul of the food into our bodies (or accepting the blessings of the gods)”, and also serves as a sign of gratefulness to nature at large and an appreciation for the farmers’ labours that resulted in the food on their tables. Maintaining the awareness that we share our world with Nature, as well as with the small, often-overlooked objects in daily life, Ishizuka’s installations transcend homogenising statements about Japanese beliefs in animism in their grounded, real engagements with the actual “lived experiences” of everyday objects. During the following year, Ishizuka spent half of her time commuting from her home in Kanagawa to the old house that was the installation site, refurbishing the house on her own. For the last six months of the project, she lived with an old rice farm couple in another nearby village called Matsuda, rediscovering the beauty of rice by working with them in the fields. She recalls fondly how every farmer would boast to her that their crop of rice was the best, and how she herself was deeply taken by the beauty of rice grains. On a very simple and uncomplicated level, rice—an integral part of culture as a nutritious staple food—promises warmth, nourishment and sustenance, while on a more intrinsic level, the aura of something wholesome and the dimension of resilience, quiet strength and beauty are carried by each and every unique grain. During preparations for the iteration of Rice Deity installed at Pearl Lam Galleries Shanghai early this year, Ishizuka spoke about this strong human affinity with rice. In the artist’s words, “Seeds (rice grains) are precious and pure, too valuable to be harmed. Love is constituted by seeds (rice) and they nourish our lives. These beautiful, transparent, delicious grains of rice are imbued with love and integrity. Rice sustains an eternal life chain, from mother to children, from generation to generation.” She also brought up the idea of rice being a deeply integral part of cultures as a staple food and its centrality to lived cultures in Asia, including Japan and China, and the rituals of eating and home life that are at the heart of human existence at various stages of people’s personal histories. 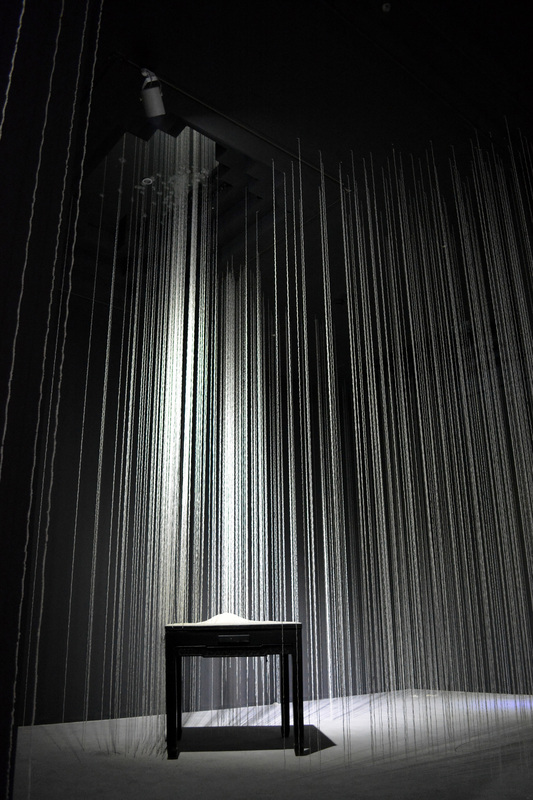 In the current exhibition, Ishizuka’s rice thread installation seeks to evoke how beautiful, resilient, commonly available yet delicate and awe-inducing rice is in and of itself. The artist tacitly reminds us how this humble staple food acts as a “connector” within a broader cycle of human existence, in that the physical cycle of growing, producing and consuming rice has been sustaining lives from generation to generation, and in that each individual’s experiences and memories, emotions and feelings, and the social-cultural associations embodied in rice and daily rituals are linked and interwoven together into what she perceives as everlasting “life threads”. 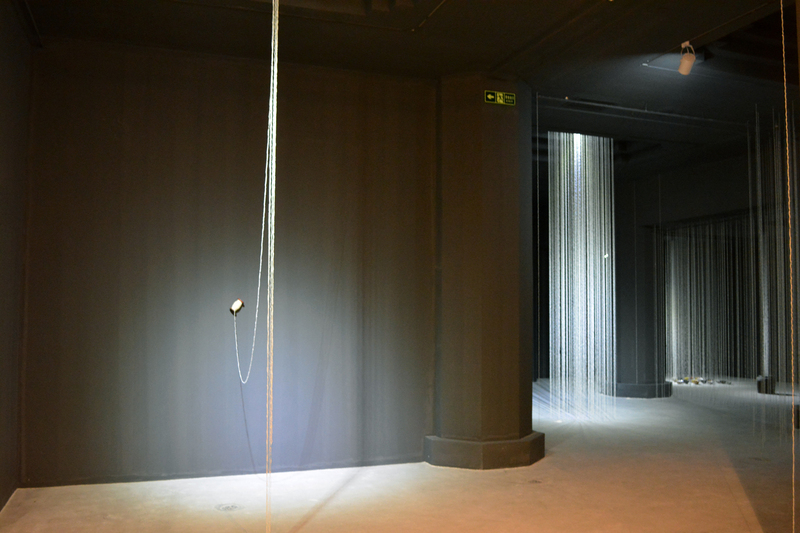 Extending this use of rice threads as metaphors for the interwoven network of ties that bind lives together, the paintings in this exhibition bring Ishizuka’s artistic practice back to the canvas in a manner that transcends the limitations of the medium’s conventions by bringing in the materials of her installation works. In paintings such as Sleeping, the viewer is offered a glimpse of a spidery network of delicate white lines travelling across a shadowy backdrop seemingly infinite in depth and scope. The painting’s tactile surfaces are a result of rice threads mounted on canvas and covered by layers of coloured acrylic paint, built up to a culminating black oil paint cover; painstakingly sanded off in certain areas, the painted surface yields to reveal the whiteness of the grains of rice and thread that lie underneath, in places vague and in others strikingly pronounced. 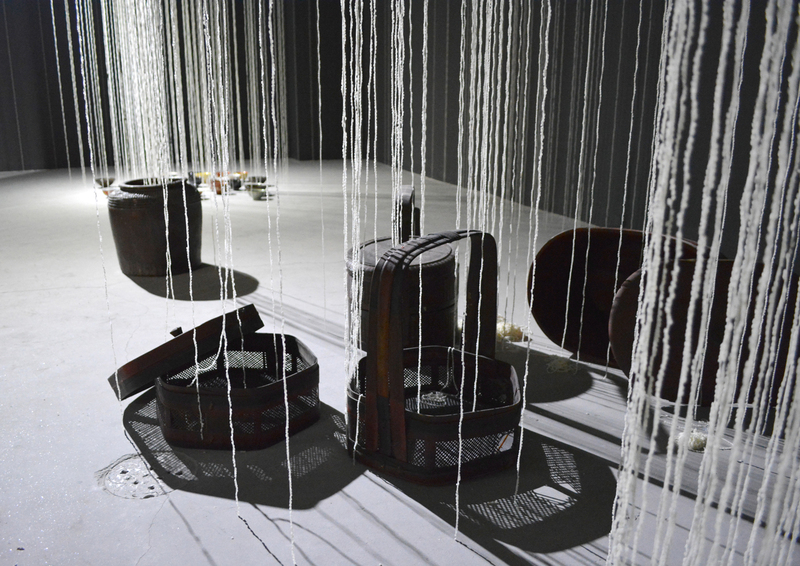 The cyclical nature of life and how this can be expressed through the objects that inhabit our lifetimes as observers and participants finds voice, too, in Ishizuka’s works made of assorted old or used cutlery, chopsticks and wooden bobbins. 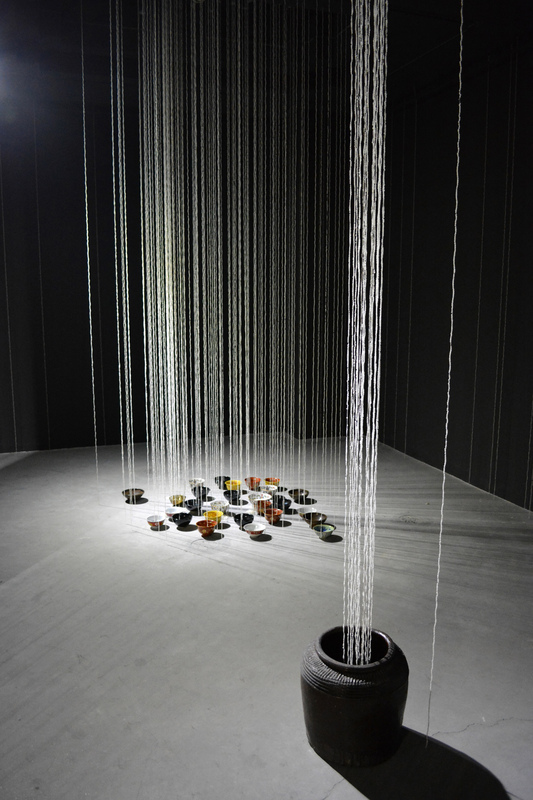 Draw Forest takes as its medium forks, spoons and knives collected from the artist’s friends and acquaintances, bound together by threads that Ishizuka characterises as “threads of memories” of the various meals that were consumed using the cutlery. Genetic and Connection build on the powerful symbolism of chopsticks as an instrument that connect food and the body, as well as a receptacle of the souls of the people who used them daily for entire lifetimes, referencing an old Japanese custom of presenting chopsticks as an offering at Shinto shrines and burning them during prayer rituals to cleanse and release the souls that inhabit them. Lined up horizontally in a way that calls to mind picture scrolls from Japan’s past, the colour gradation formed by these linear sequences of well-worn chopsticks seems to gesture at life forces being passed on and inherited, stories about living and eating spun out one after another ad infinitum. Neither readymade nor conventional painting and sculpture, and suspended between cerebral and expressive statement, Ishizuka’s works are rendered with a sensitivity and evocativeness that entreat us to think about the simplest and most readily overlooked of objects in the most expanded of ways. Rather than treat the medium of an artwork as a series of lifeless materials that one subsequently fits into a configuration of pre-conceived concepts, Sayaka Ishizuka views each object in her works as an originator of artistic expression. Laden with social and cultural meanings, these objects, treated with due sensitivity by the artist, articulate an interwoven web of conversations in which viewers are invited to enter, and prompt us to think about the tenuous links in our own lived realities.